Buy online authentic acorn-fed 100% ibérico Ham. Passion for gastronomy. Discover the Cinco Jotas special packs and limited editions. Essential for those who love the best acorn-fed 100% ibérico ham in the world. Professional ham tongs made from stainless steel. Tongs with curved tips to more effectively pick up slices of freshly-carved ham. Professional ham tongs made from stainless steel. 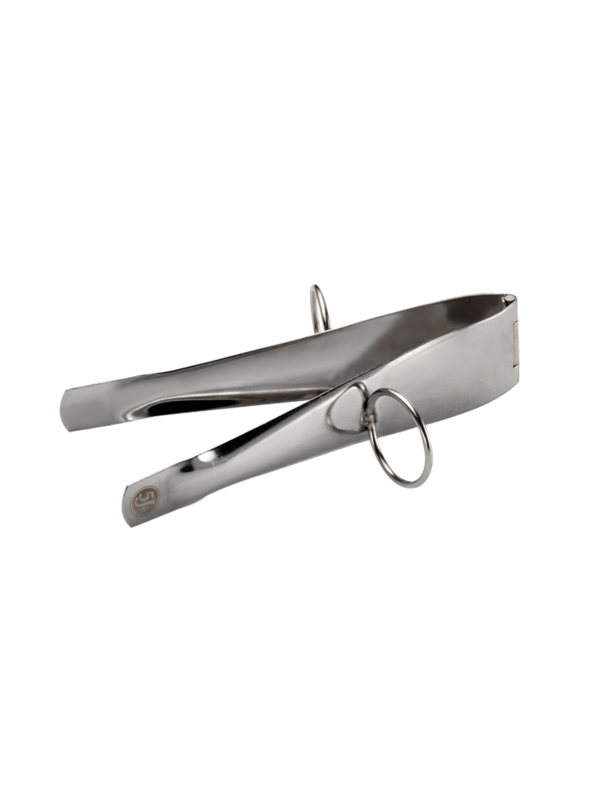 Cinco Jotas tongs are sufficiently flexible and resistant for maximum precision. As they are made of stainless steel, they are not only durable and easily cleaned, but they facilitate the professional art of ham carving. Home and origin of the authentic Cinco Jotas 100% Ibérico Ham. Craftsmanship and tradition that have been a hallmark of Cinco Jotas for close to 140 years. It is a legendary brand with more than 130 years of experience conserving the purity and authenticity of the best 100% ibérico pork products in the world. The unique climate in Jabugo impacts the curing process of the ham and helps contribute to what many consider to be the most exclusive ham in the world. A unique ritual that has been passed on from generation to generation. A Cinco Jotas acorn-fed 100% ibérico ham can be appreciated using all the senses: the warmth of the ham when holding it in your hands, the succulent, smooth texture in your mouth, the herbal aromas that combine nutty acorns with natural herbs, and – at last – that unforgettable flavour that stays with you long after the last bite is, sadly, gone. Discover the secrets around Cinco Jotas acorn-fed 100% ibérico ham and keep track of the hottest news. I agree to the processing of my personal data for the activities indicated. We process your personal data to send you messages about OSBORNE products and services, manage invitations to events and identify your customer preferences. The data shall not be communicated other than to the OSBORNE Group companies to which the request refers, and to support the service or to comply with legal requirements. To access, rectify and erase the data, and other rights as set out in the additional information. You can find additional information on the processing of your personal data on the following link INFORMATION ON PROTECTION OF PERSONAL DATA RELATING TO THE NEWSLETTER.